Chocolate and banana,sounds like an interesting combo,doesn't it?When whipped up into a cake with a smooth ganache on top,it definitely becomes a treat for the palates.I have quite a few Banana bakes in here,with Roasted Bananas flavored with Rum,Eggless Banana Muffins with Apples and a Plain fabulous Banana Cake but pairing it up with chocolate has never been tried before. Despite me trying not to (over)bake with chocolate,I somehow end up with at least one chocolate post(if not more) every month.Anyone's complaining?? Just like this cake,this one's very easy to whip up too.Just two bowls,mixing dry ingredients into the wet and the batter is ready within minutes.I baked this for two kids at home now and they were relished with much gusto.Yes,the last crumb was polished off along with licking the ganache off the plate,what more could the happy baker in me want:). Preheat oven to 180C.Grease and line a 9/13 rectangular pan. (I used a 9/9 square baking dish and baked the rest into cupcakes). 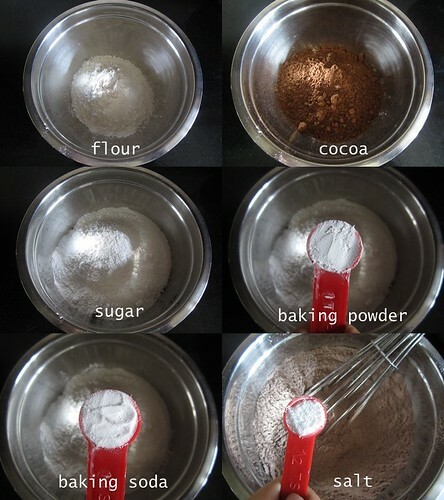 In a big mixing bowl,mix together the dry ingredients starting with flour,cocoa powder,sugar,baking powder,baking soda and salt.Whisk together with wire whisk and keep aside. 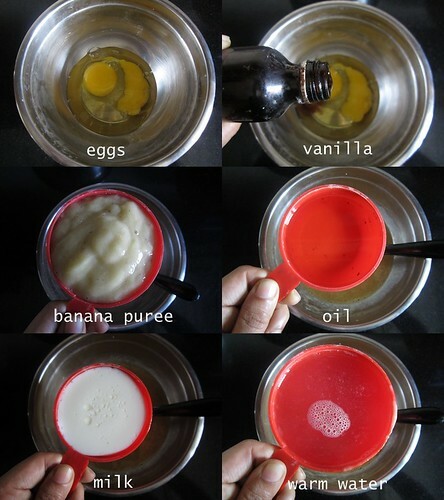 In another mixing bowl,whisk together eggs,vanilla extract,banana puree,oil,milk and warm water. Pour the wet ingredients into the dry and mix together till you get a smooth,lump free batter. Tip the batter into the prepared baking tin and bake for 40-45 minutes or till a toothpick inserted into the center comes out clean. Cool in the pan for 5 minutes and finish cooling in a wire rack. In a thick bottomed stainless steel pan,heat the cream until bubbles start appearing on the sides. Mix in chopped chocolate and stir for a while.Switch off heat and let it sit for 5 minutes. 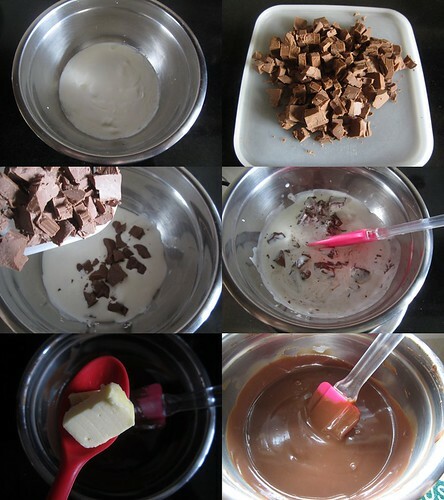 Whisk well till no chocolate lumps appear and the ganache becomes smooth and creamy.Mix in the butter. Let it cool down to room temperature and use as required. 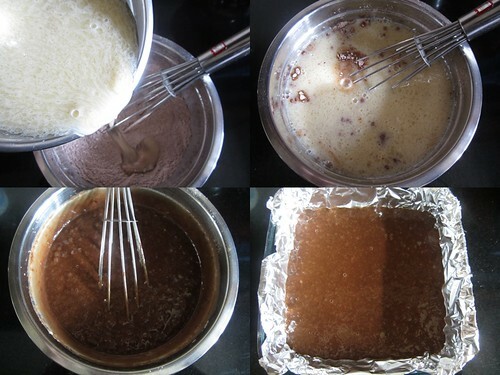 For finishing off-Pour chocolate ganache over the cake and smear on the sides too.Let it sit for a while till the ganache sets(you could refrigerate the cake too! ).Serve chilled. 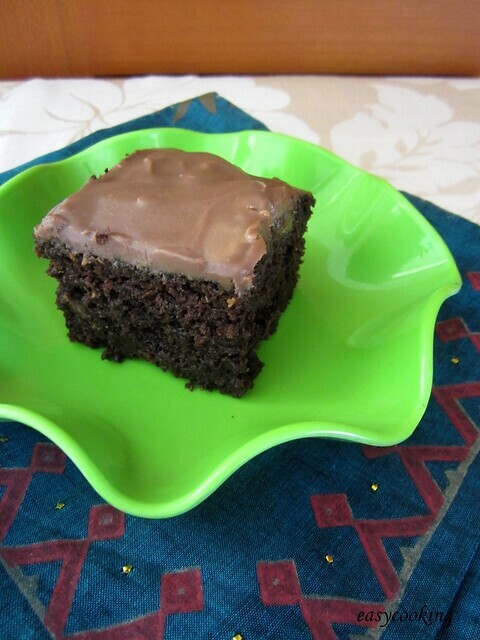 The cake remains moist even after refrigeration because of the oil and the banana added into it.Makes for a perfect party cake.Bake it in a Borosil dish and serve it straight from the pan,makes for lesser cleaning up. The banana flavor is quite light but makes for a perfect pairing with chocolate. 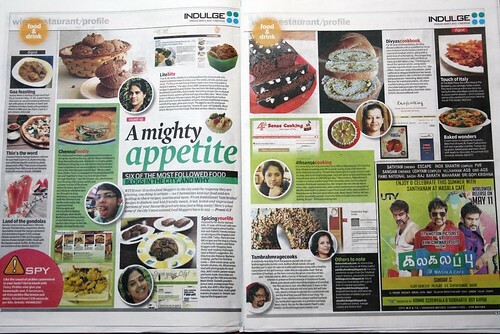 Another exciting news I've got to share with all my readers is that Easycooking was mentioned on Indulge(Indian Express)on May 4th,Chennai edition as one of the most followed food blogs in the city. Congratulations on the special mention in the newspaper. You deserve it. Congrats divya and very happy about that. Wow congrats onbeing featured. Cake looks yum. congrats. and cake looks awesome. 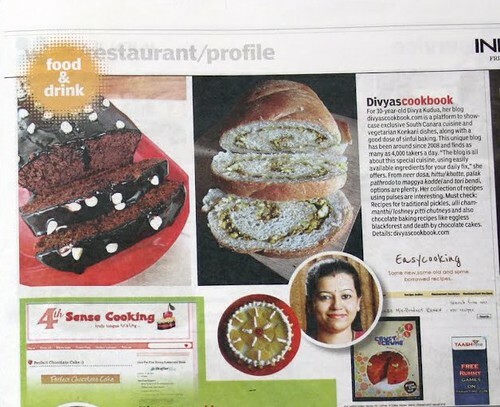 Congrats divya :) cocoanana cakes are my favourite too.. i think i had submitted one muffin to you too long back..
slice looks moist and perfect! Yes I remember-you had baked in ramekins and the muffins had puffed up so well! Surely is fantastic..if I were in those kids place, wd hv licked the plate clean! :) COngrats on being featured ..yet again! Pragati to you n DCB! Divu..this one's in my oven.. heavenly aromatic..added half C choco chips..tsste n tell tom..ie feedback to follow tom..tks! I recently bought a samsung combination (MW/Convection/grill) oven. I was so eager to bake and this is the first recipe I tried. Preheated and baked in convection mode at 180 C for 45 mins but the cake absolutely did not cook in the middle at all, got cooked only on the sides and top. It rose beautifully but only the side and top layer baked, the rest was as is. What do u think went wrong? I placed the tin directly on the round table, is that what went wrong? Would be very happy if you clear my dilemma. Sometimes the temperature and timing may differ from oven to oven.I think the cake was not cooked through in the middle because of either lower temperature or not sufficient time.Try increasing the heat and check after the suggested time.As and when you start baking in your oven,you will have a better idea of how long it takes to bake irrespective of the timings mentioned in the recipe.Happy Baking! 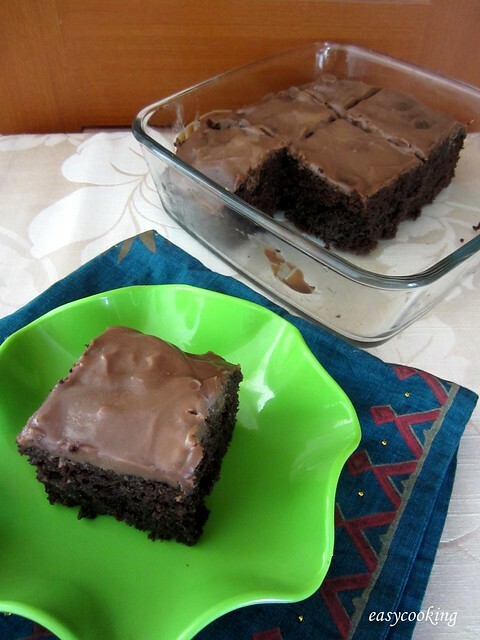 Thank you for this wonderful post on chocolate banana cake, I am definitely going to try this. I am not a big fan of baking soda. Do you think we could subsitute baking soda with additional baking powder, would that work? Please let me know what you recommend. 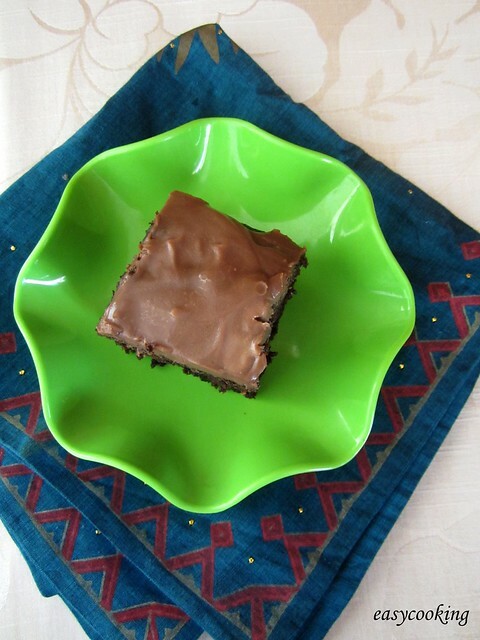 Divya, I have made this cake 3 times and it has turned out well all the time. My sister made this for her sons bday and I am planning to bake this for my sons bday too! Great recipe!